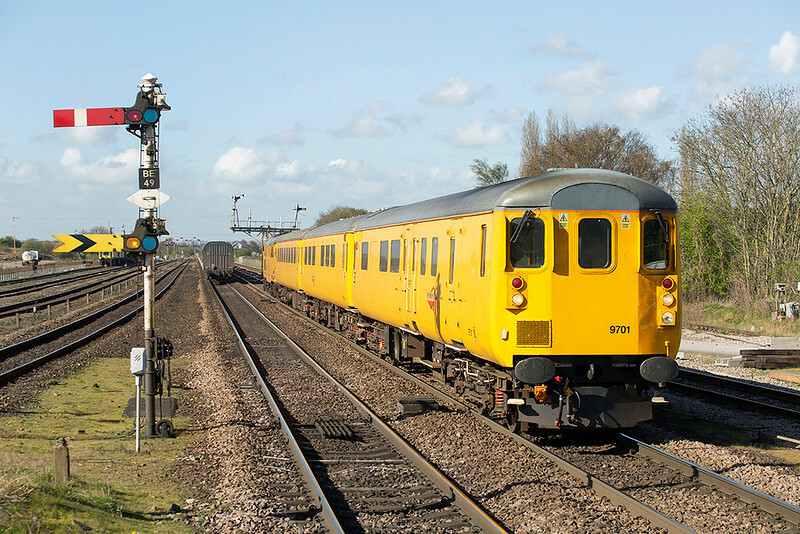 Welcome to another installment of the Railwaymedia blog, this being the 56th (well really the 58th due to several 'two-parters'), and the first for over a month. The tardiness of getting round to writing this has been more down to me being too busy taking and processing pictures for once rather than not having any trips to talk about: I thought I'd better squeeze an April edition in somehow! Having resumed taking pictures of buses, when convenient, I am finding more time then ever is spent processing the pictures. Whereas a good days railway photography can result in maybe 20 to 30 images, just an hour in a busy town centre location can result in that quantity of bus ones. Again as I have mentioned before, the bus side of things isn't really taking the place of railway photography but rather using up time when I would either be in the pub or nowhere near the railway anyway. Certainly I am finding on my outings to Wetherspoons I am having to leave far more time in the respective towns than hitherto due to trying to hunt down the dwindling stock of older buses. Volvo Olympians and B10M's (pictured above) are increasingly hard to find with the three major bus groups (Arriva, First and Stagecoach). Like railways where I only resumed photographing again after the older engines had been retired I appear to have done exactly the same with buses. I got to both Glasgow and Chester with work, which enabled an hour or so of photography on the streets of both cities after local buses, though a longer trip to Northamptonshire was aimed more at visiting Wetherspoons pubs with a few bus pictures in the likes of Corby and Kettering. The one railway picture of the day was a surprise find in the town of Rushden, about midway between Kettering and Bedford. There is a railway Transport Museum situated in the old station area. It was dusk when I arrived but having about 15 minutes until the bus I had chance to take a quick look. A shame I hadn't arrived earlier as it is open to the public most Fridays and Saturdays. 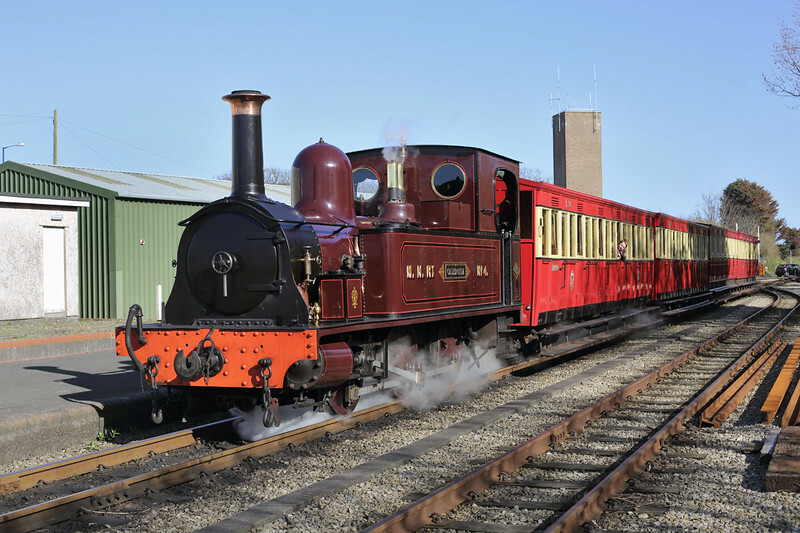 There are various small steam and diesel locomotives and even former Blackpool Tram number 634. 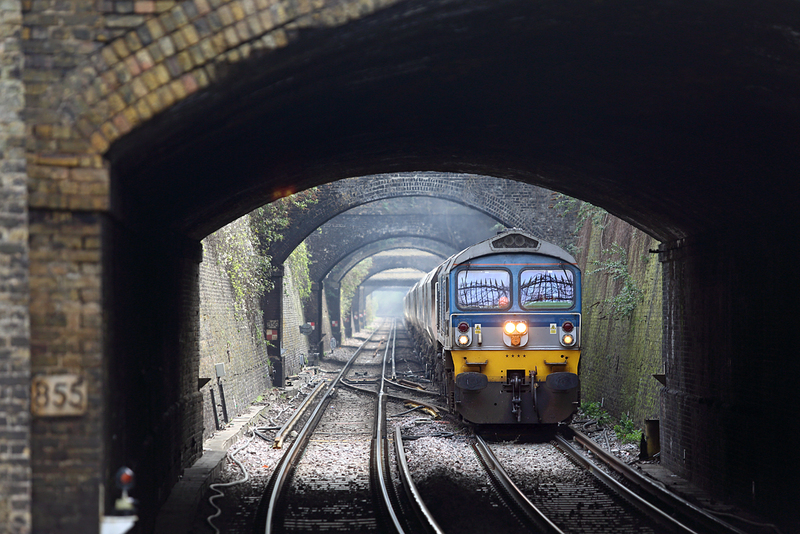 Another long trip was made the following week to Kent, this time with more of a railway theme. Again the main purpose was to visit the remaining Wetherspoons in the area I'd not previously had a drink in. 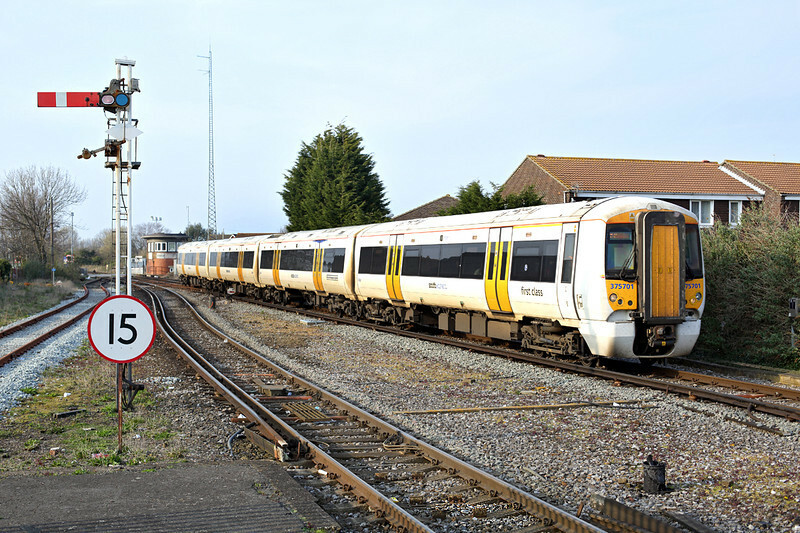 As Thanet is normally only served by South Eastern's class 375 units I wasn't expecting too many pictures although a mediocre shot of a class 59 at Gravesend was a bonus. The main place I was aiming for was Deal where not only was there a new Wetherspoons but also one of the Southern Region's few remaining mechanical signal boxes. Even with little variety of trains passing it was still worth a few shots of the station area before the signals get removed. My plan was to get the 1845 High Speed Javelin service from Dover to London for an easy walk to Euston for my train home. Sat in the pub outside the station 15 minutes before departure there was an almighty bang and flash as a thunder storm suddenly burst over the area. Another, followed by the station lights going out, wasn't a good omen, and I ended up stuck there for two hours as more lightning had burnt out a substation at Folkestone. At least I did eventually get home, unlike many Eurostar passengers, as they were badly affected by this storm for the rest of the night. At least once signalling control was restored I could make my way back via Faversham. My next rail trip wasn't for two weeks. 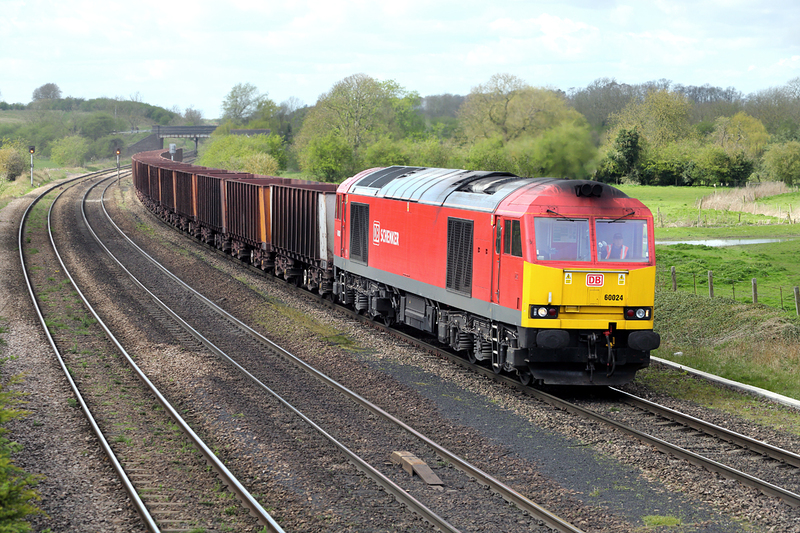 I wanted to get some reasonable railway shots for the first time in a month so chose Barnetby as it was some years since my last visit to this freight hotspot. I was lucky with the weather: I had decided on the destination without really studying the forecast, and arrived to lovely clear skies. Clouds did drift over for a few hours mid-morning but either side it was beautiful sunshine and well worth a few hours watching the regular coal and iron ore trains. If you've never done the classic Barnetby station shot before (above) then it is time to get over as there are plans underway to resignal the Barnetby and Wrawby Junction areas removing the best collection of working semaphore signals still left in the country. 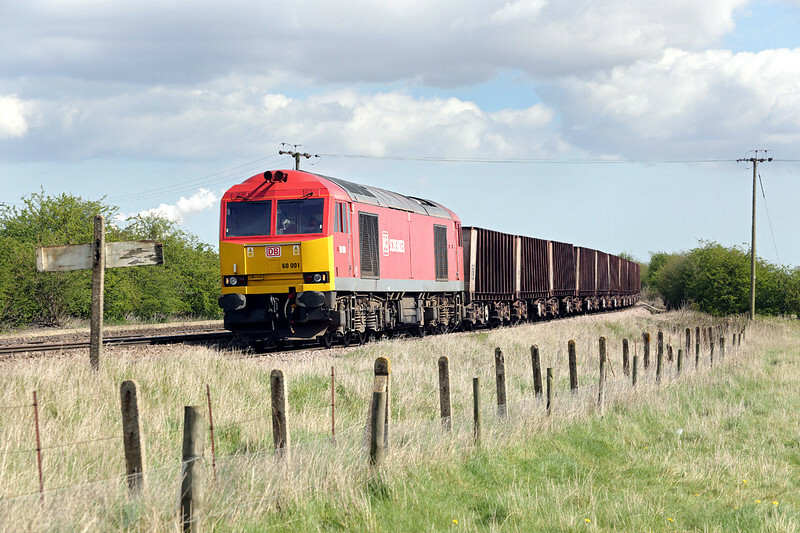 Many people will visit the area by car enabling easy access to the various locations on the route between Scunthorpe and Brocklesby Junction where the majority of the freight trains can be seen, however even if arriving by train there are a few good locations easily reached on foot. A footpath heading east behind the signal box from Barnetby station takes you to the popular overbridges at Melton Ross and New Barnetby. There is also a shot from the field just past the latter. I went there for the return of the Network Rail test train. 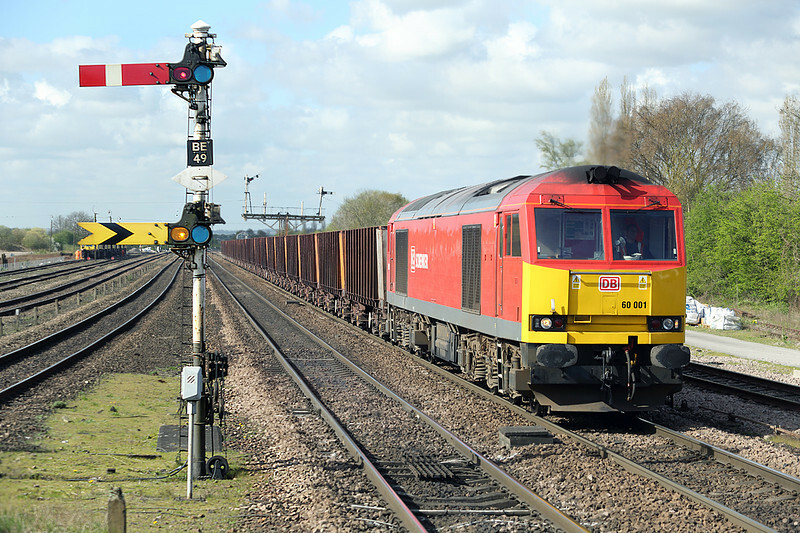 Whilst it arrived at the same time as a cloud, 60001 I had also photographed earlier returned from the docks in a nice piece of April sunshine. I have often found at Barnetby that things go a bit quiet in the afternoon so I had already decided to move on after dinner time and head towards Cleethorpes for several reasons. First of these was to do the railway line to the resort, I have never previously been by train past Habrough; I would have liked to also do the Barton-on-Humber branch line but there wasn't the time. Second was, as always, to do several branches of Wetherspoons. Annoyingly the one at Cleethorpes doesn't open until July so I shall have to return then. Third was, as common now, to get some bus pictures from the Grimsby area but fourth was to see the minature Cleethorpes Coast Light Railway. In hindsight I would've liked more time at this small line, especially as there is a fine real ale bar in a small signal box at the main station. There was only one engine in action as I caught the last few trains of the day, the engine being a diminutive 0-4-0 diesel locomotive that the railway acquired from, of all places, Tasmania. 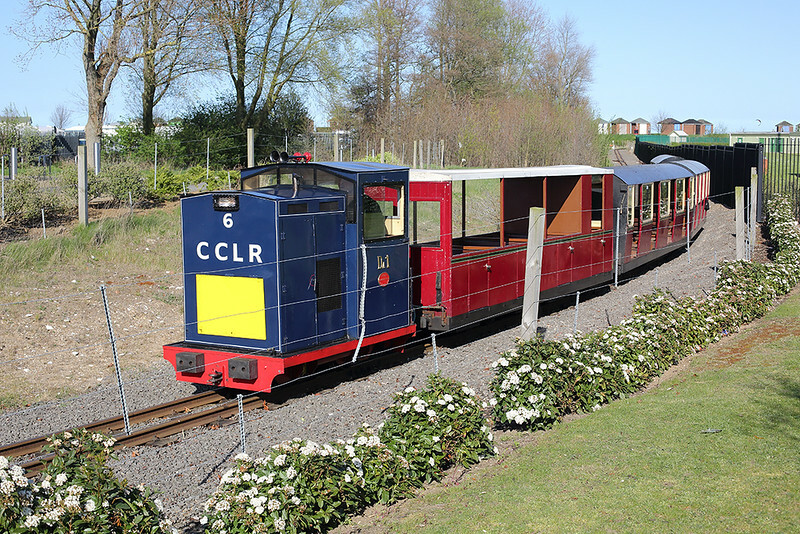 Built for the Bush Mill Railway in 1986 it makes quite a good noise as it trundles along the edge of the Cleethorpes boating lake. Well worth a visit. The rest of the family had gone on holiday to the Isle of Man that week as I was, nominally, working, however I took a couple of days off to make a short trip over to see them. Given the presence of three railways, buses and excellent beer the decision to go wasn't difficult! It was the first time I had flown from Blackpool Airport. A convenient departure point, except for their £10 'Airport Development Levy' which, for a family parking their car for free and going on a week's foreign holiday isn't too bad, but for a lone traveller making a short flight becomes a very sizeable addition to the airfare. There also doesn't appear to have been much development taking place recently. Anyway, the 25 minute hop over to Ronaldsway airport was by far the shortest flight I've ever made and on the smallest plane I've yet been on. The Citywing LET 410 was quite an experience! 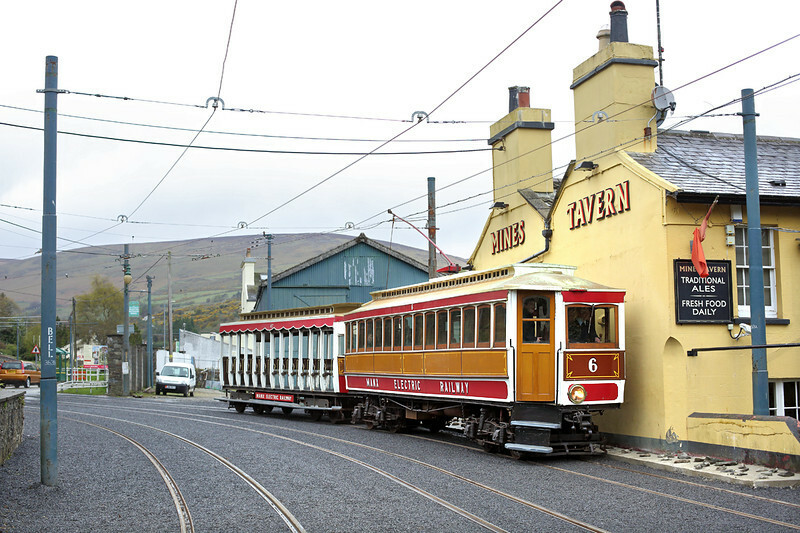 I spent most of the first day there on my own getting a £7 bus day ticket and having a tour around a fair bit of the Island visiting some of the excellent pubs and also getting pictures of the steam railway and electric trams. The weather wasn't fantastic but improved the following day. I had to spend at least a bit of the visit with the family but managed even on this second day, when the weather was beautiful and the sun scorching hot, to get some pictures. We went first to Douglas for the family to do a final bit of shopping, though we went via Onchan so I could get a nice panoramic tram picture with Douglas Bay behind. The Sidings pub next to Castletown Station was an excellent place to go for dinner, not only because of the cheap food and superb range of hand-pulled beers, but also because it enabled me to nip out for a picture whenever a train was due. 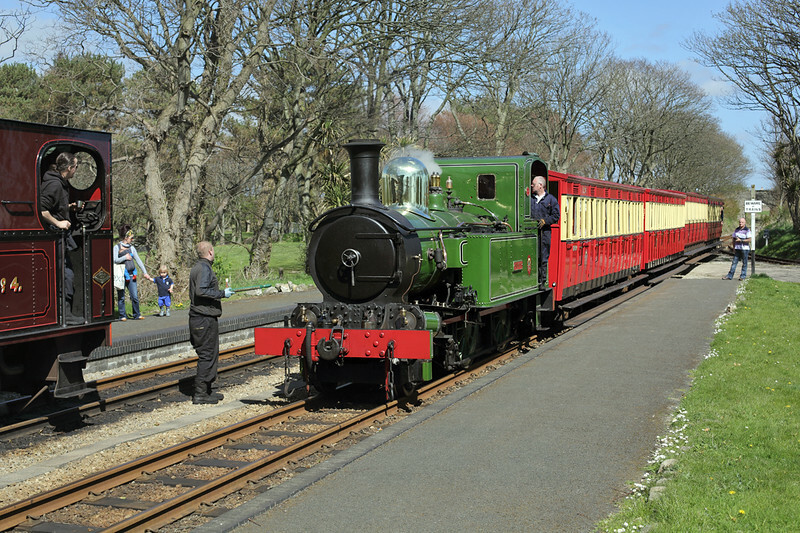 Usually the Isle of Man Railway run a two-hourly timetable using two locomotives, however as this was Good Friday and so a Bank Holiday it meant there was a slightly more frequent train service operating with three engines in steam. 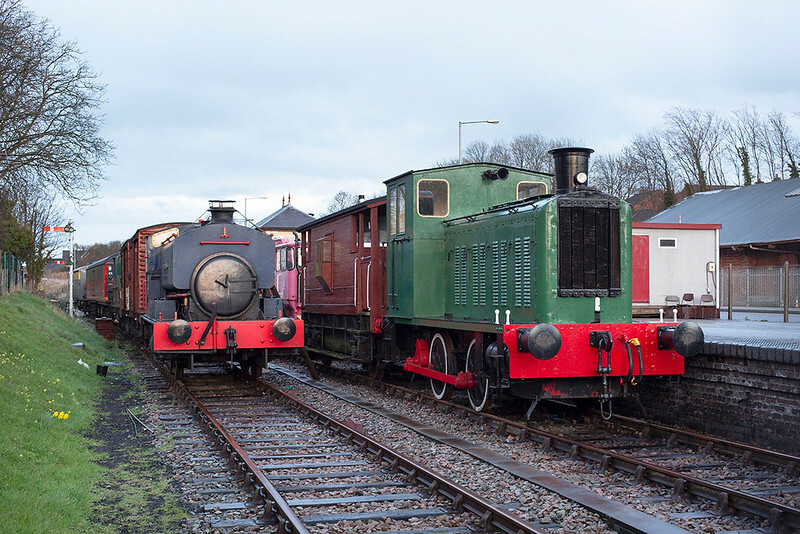 One of these was number 15 'Caledonia', former Manx Northern Railway's number 4. In my last few visits I had never seen, let alone photographed, this particular engine which looks outstanding in its old MNR colours, so leaving the family sunbathing on the beach 5 minutes walk away, I nipped up to Port Erin Station for its arrival. I even managed a final shot of number 10 'G.H. Wood' leaving Castletown on the 1757 departure, got to the airport in time for my 1900 flight, and still had time for a leisurely pint of beer before boarding. Both at Blackpool and Ronaldsway airports it took longer to take my belt off and on for the scanners than it did to get through the rest of security. Shame every airport isn't like that! 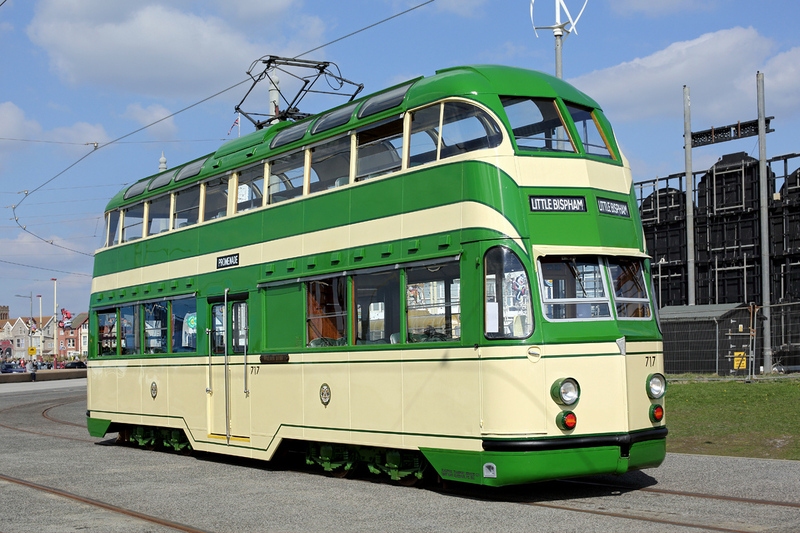 As the rest of the family, travelling by ferry with the car, weren't expected home until after dinner the following day I went over the Blackpool to see some of the heritage trams that were in operation over the Easter weekend. 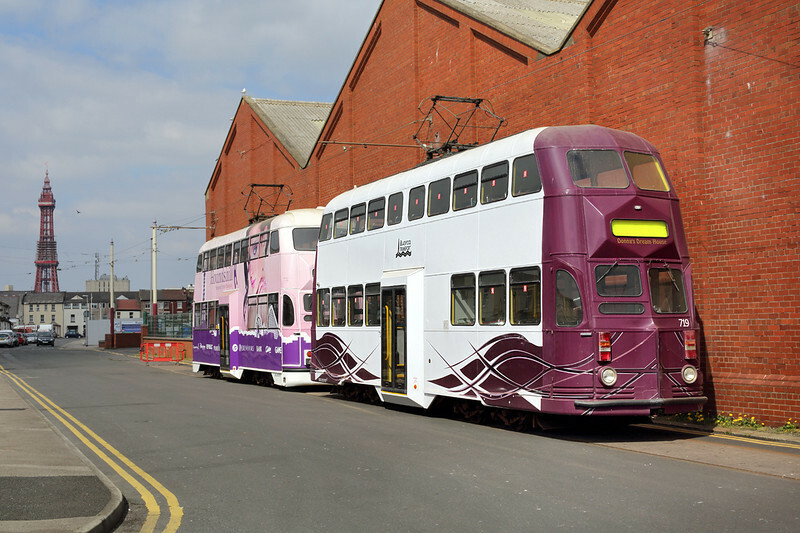 There were four trams booked to be operating tours from the Pleasure Beach to North Pier and beyond. 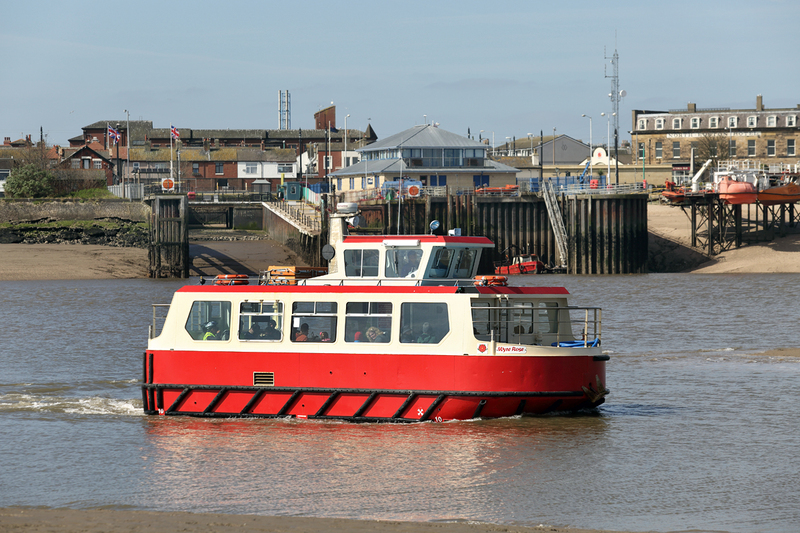 I like going via Poulton and the Knott End Ferry to Fleetwood. At very low tide the ferry has to stop running, on this day the 1100 one was the first that could run so I just missed the morning run of the heritage trams to Fleetwood. I did get a picture of Bombardier Flexity tram 016, the first of the new trams to recieve all over advertising. 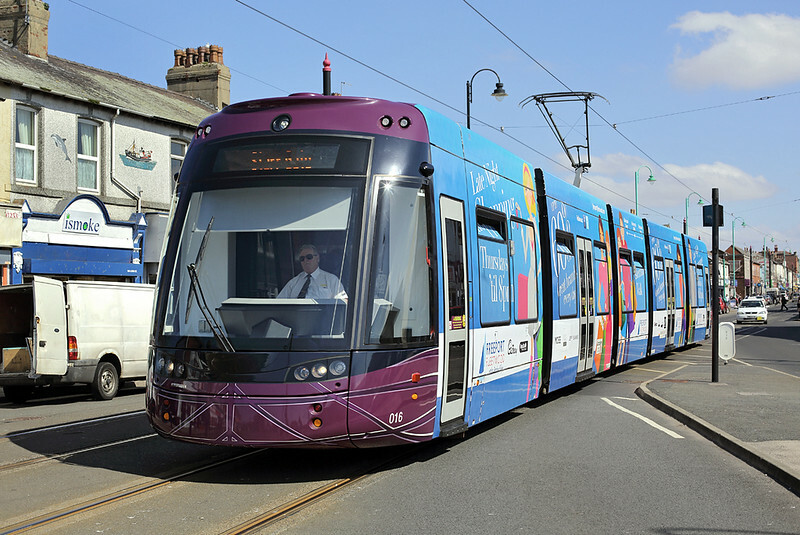 Personally I don't think it looks too bad externally but apparently it is very difficult to see anything out of the windows and it has even been pointed out that the have covered up the external destination displays! Like the first day in the Isle of Man clouds came over during the mid-part of the day. Heritage trams 230, 600, 717 and Twin-car 272+T2 were out in operation in addition to two Balloon cars (713 and 719) being parked out in the street next to Rigby Road depot for a few hours. I could of course wait for a sunny break for a picture of the two Balloon cars, I also got in sun newly named 717 which was on display at the Pleasure Beach awaiting a final evening trip to Fleetwood. I am hoping to get one or two trips in somewhere next week: I might intersperse these with a few local bus pictures as I am trying to make up for not photographing any for the last 20 years. As always any new trip galleries will be held in the New Additions section for the first month or so before being moved to their permanent home in Trips 2014; when galleries are predominantly of buses I try to include the word 'Buses' in the title. I also need to continue with the job of reprocessing the scanned 1990 bus pictures that I already have uploaded before I can recommence the actual scanning: all my vaguely useable railway pictures from the 1990's have finally been done. Thanks as always for taking the time to read this blog, please look out for the next or become 'friends' on Facebook to receive more information on where I've been. 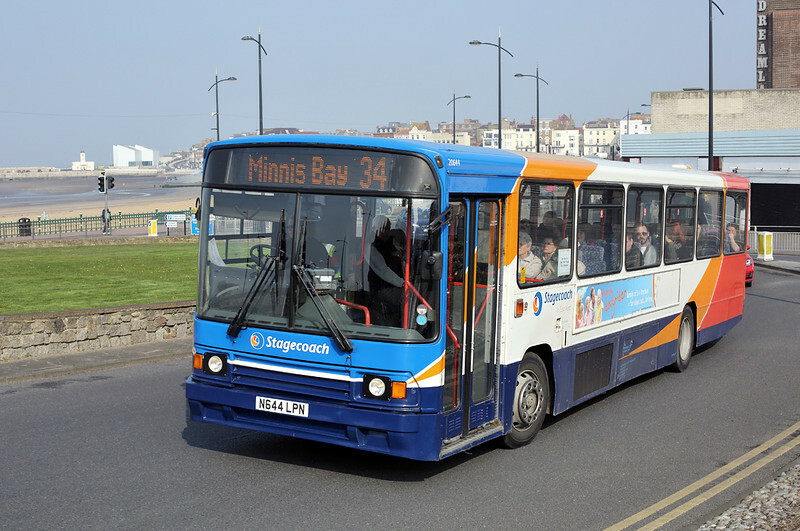 At the bottom of the page you will find a list of the ex-Isle of Man double deck buses now in service with Blackpool Transport. I've been unable to find a definitive list so I've cobbled this one together mainly from posts on the excellent Fylde Bus Blog. I've included it here principally to save me trawling the internet to find details everytime I need them though hopefully someone else will find it useful too! 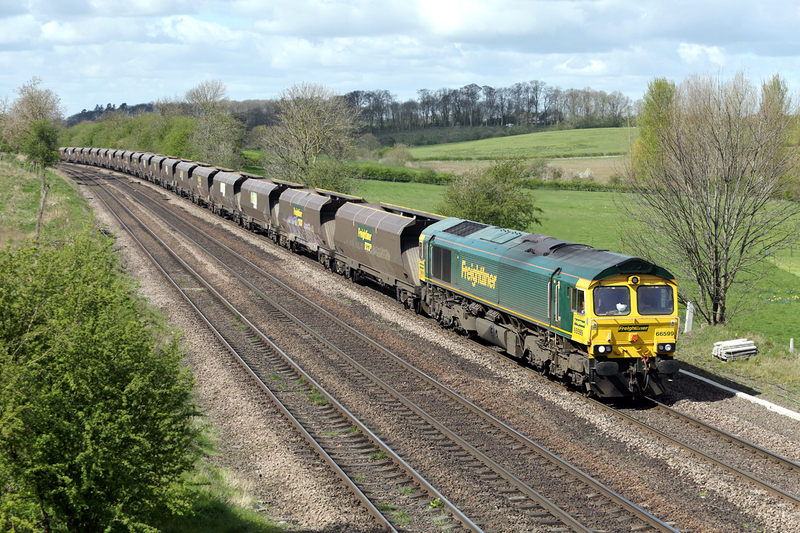 I'll leave you with a picture of a pleasant way to spend a nice sunny hour by a busy freight railway. Bye for now! 343-353 Chassis: Dennis Trident. Body: East Lancs. 354-372 Chassis: DAF. Body: East Lancs.